SANTO DOMINGO, Dominican Republic — Diagnose the problem. Recommend the treatment. An infectious disease specialist with 35 years of medical experience, Dr. Miguel Núñez now administers the wisdom of God’s Word and the integrity of a godly life to treat the spiritual ills of Latin America. Whether he is preaching to his church of 2,300 on Sunday morning, responding to pressing questions on his internationally broadcast program Answers, or visiting a patient in the hospital, Núñez urges thousands to be transformed by the gospel of Jesus Christ. Núñez prays with the IBI worship team before the morning worship service, Jan. 11. 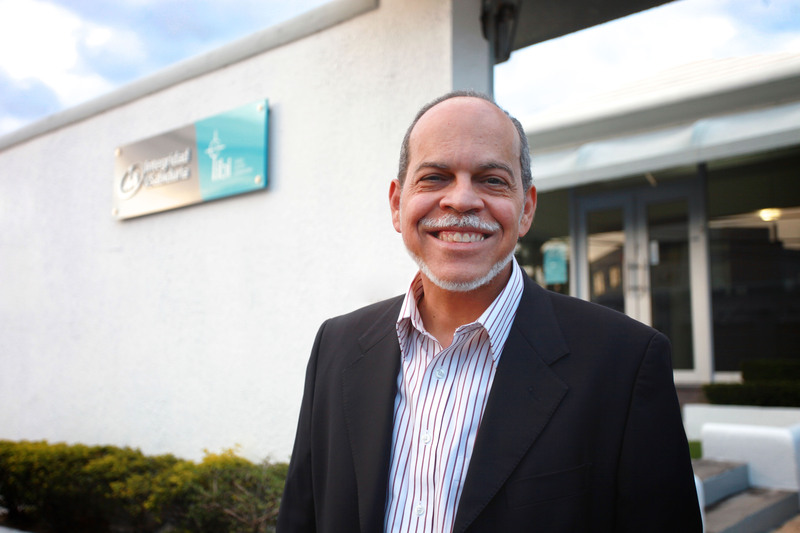 In December 2014, Núñez received his doctor of ministry degree from The Southern Baptist Theological Seminary. His thesis, “The Power of God’s Word to Transform a Nation: A Biblical and Historical Appeal to Latin American Pastors,” calls for pastors to “seize the moment” of spiritual awakening and bring to Latin America what happened in Europe during the Protestant Reformation. Inspired by the efforts of the Reformers, Núñez says his understanding of cultural transformation borrows from John Calvin’s emphasis on God’s sovereignty and Martin Luther’s example of “standing for [God’s] truth” when no one else does. Raised Roman Catholic, Núñez began attending an evangelical school in the third grade but says he did not practice a living faith. 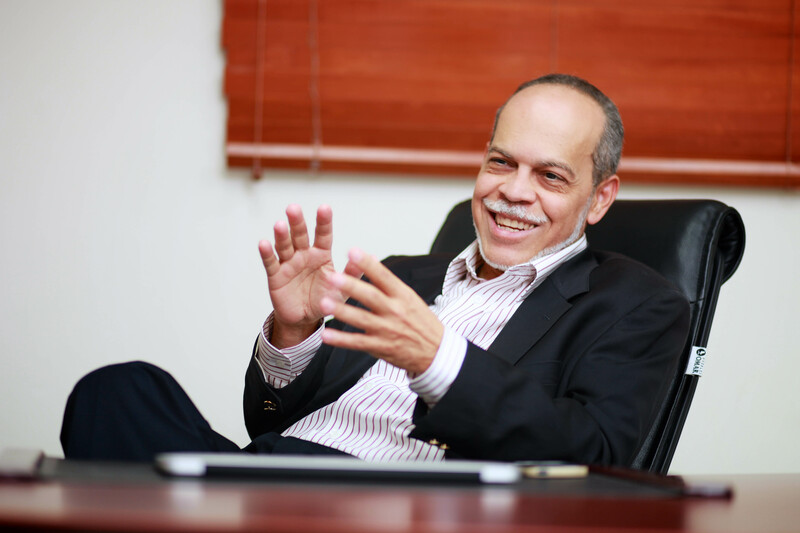 He earned his medical degree in 1980 from Technological Institute of Santo Domingo (INTEC), where he met his wife Catherine. After marrying the following year, the couple moved to New Jersey in May 1982 to earn their medical specialties and open a practice. His brother’s death in February 1983 marked a significant change in Miguel’s life. The elder sibling was the only evangelical in the family, and his fatal plane crash prompted Miguel to attend an evangelical Bible church. “That year, I developed a hunger for the Word that never left and has been increasing ever since,” he said. Núñez continued his medical practice and began studying theology and church history. But his hunger for growing in his Christian faith awakened him to a great spiritual need in his home country. Núñez says he noticed a great divide between the rich and poor, and how the educated middle class remained largely unreached for the gospel. He identified the problem with Latin American Christianity rooted in the lack of expository preaching and a simplistic rendering of the gospel that did not reach the educated class. Miguel and Catherine decided to accept a call to ministry in 1994 and spent the next three years preparing for ministry and selling their medical practices in New Jersey. 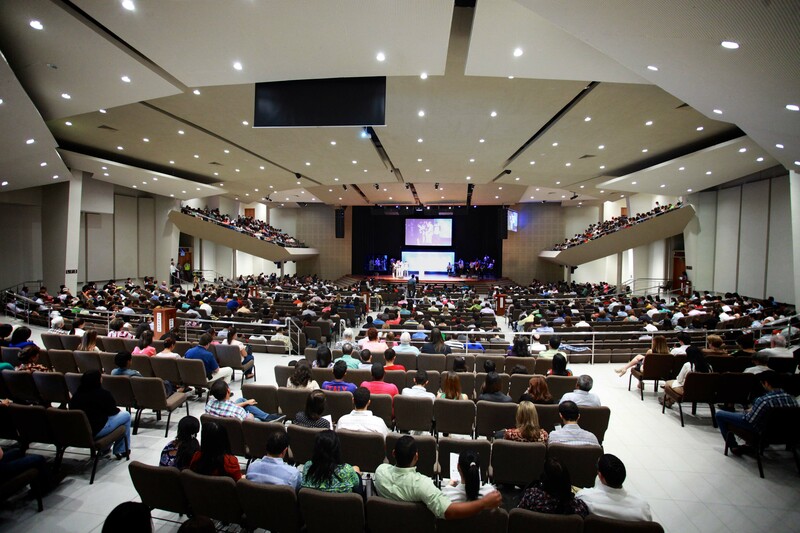 In January 1998, Núñez and his Bible study group replanted an English-speaking church and simultaneously planted a Hispanic church in Santo Domingo as Iglesia Bautista Internacional, known as IBI. The congregation of Iglesia Bautista Internacional gathers for worship Jan. 11, 2015. Seventeen years later, IBI is a 1,300-member church with a regular Sunday attendance of 2,300. After seven years of preaching multiple services in two different languages, Núñez dedicated his focus to the Hispanic congregation and brought on another pastor for the English congregation. 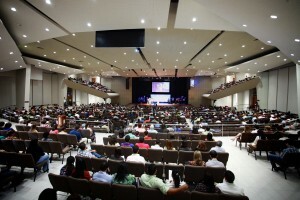 As the English-speaking church dwindled, Núñez viewed the transient foreign believers as a ministry of the church rather than a separate congregation. English-speaking attendees now receive in-ear translation during the announcements and sermon. Doctors, lawyers, and educators are among the professional middle class worshiping each Sunday and serving their communities throughout the week. By demonstrating the wisdom of God’s Word through expository preaching, Núñez says these church members began approaching him with ideas to care for the poor and impact their spheres of influence. “You preach the gospel in a way that you teach people that this gospel has to make a difference in your practice, in your life. And then they come to you with the ideas because they got fired up when they were able to see it in action in your life. They get the idea that this is possible,” he said. 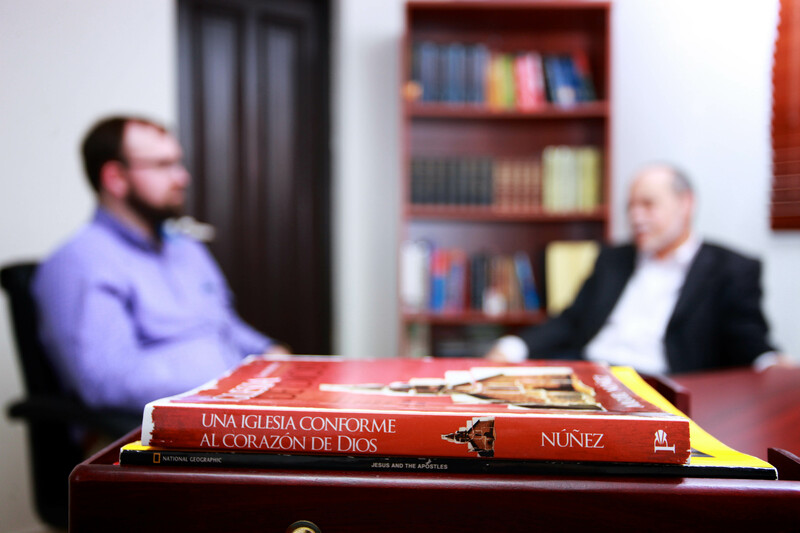 Núñez discusses his ministry with Southern Seminary Magazine in his office at Wisdom & Integrity Ministries. He attributes the preaching ministry as the inspiration behind the prison and hospital ministry Without Walls and the HOPE program, a partnership with the nearby Ashton School to provide 45 children with a bilingual education paid for by the Christian community — tuition, school uniforms, medical and dental insurance, books, and meals. Núñez credits his medical background with allowing him to preach with clarity and precision. Just as he explains complex medical cases in simple terms for his patients, Núñez breaks down theological truths for his congregation to enable greater understanding. Although he no longer has his own practice, hospitals continue to seek Núñez’s expertise in infectious diseases on a case-by-case basis. He stores his stethoscope in his car, often visiting patients on his way to the church office or on his way home. Maintaining his role as a physician, an authority figure regarded with high esteem in Latin America, provides an extension for his ministry outside the church walls. In 2001, Núñez visited a patient on Sunday morning before the church service while he considered abandoning medicine altogether to focus on the ministry of IBI. During his visit, Núñez shared the gospel with the patient and his wife and led them to a profession of faith in Jesus Christ. Rather than impeding his ministry, medicine was a tool that opened doors for Núñez to minister to the souls of his patients while caring for their bodies. Núñez first made preparations for Wisdom & Integrity Ministries, which operates in Latin America as Integridad & Sabiduría, in 1996 while living in the United States. He patiently waited nearly a decade before sensing the Lord’s calling to launch the ministry in his church. When IBI launched Wisdom & Integrity Ministries in 2005, Núñez began his TV program, Answers: Absolute Truth for a Relative World. The program is now broadcast into 30 Latin American countries and the United States. 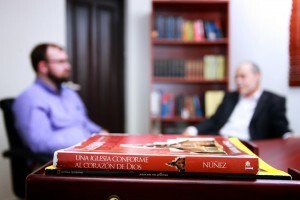 Answers is an avenue for Núñez to extend his vision to the rest of Latin America, which he says often regarded Christianity as an irrational faith with no connection to real-life problems. Núñez preaches a sermon on 1 Thessalonians 2:13 during a Jan. 11 worship service. In order to extend the gospel transformation taking place in Santo Domingo to the rest of Latin America, Núñez and his church offer theological education through the Institute of Wisdom & Integrity. Núñez says that a personal investment in training ministers and writing Spanish-language resources to support their efforts will advance the reformation vision. 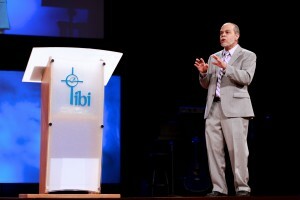 In 2011, IBI hosted the inaugural “For His Cause” conference, which each year unites more than 7,000 evangelical Christians from across Latin America. The conference has hosted speakers such as John Piper, John MacArthur, and Southern Seminary President R. Albert Mohler Jr. Through efforts like “For His Cause” and his role as a council member for The Gospel Coalition, Núñez has reconciled evangelical churches and pastors long divided over difficult issues. S. Craig Sanders is the managing editor of Southern Seminary Magazine. Lidia Limardo is a freelance photographer and member of Iglesia Bautista Internacional in Santo Domingo, Dominican Republic.